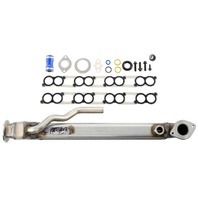 2004-2010 6.0L Ford Power Stroke * Exhaust Recirculation Cooler * # AP63446 | Diamond Diesel & Turbo Service, Inc. Note 1: Includes AP63447 Exhaust Gas Recirculation (EGR) Cooler Intake Gasket Kit. Note 2: Return the EGR Cooler core and you will be eligible for a $100.00 refund. Call 1-800-400-9095 for Details.